Plenty of scientific books have been written about pattern recognition; this will not be one of them. Sure enough, this book is about patterns, but it's mainly about chess. Another thing that should be clear from the start is that you will not encounter tactical patterns here, like for instance all kinds of mate images. In this book you will find predominantly positional patterns. 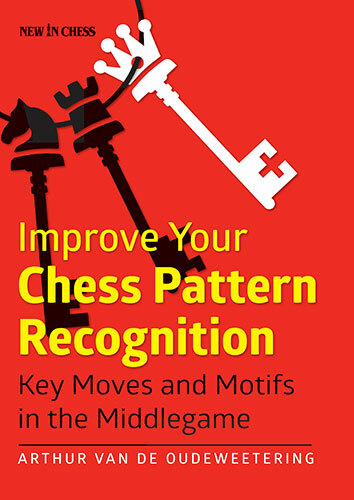 Finally, it must be said that this book is about the middlegame. Sometimes a pattern will be more easily explained in the endgame, because there are less disturbing factors in the form of other pieces there. These may well spoil the point you are trying to make. Take for instance the rule that opposite-coloured bishops favour the attacker when the major pieces are still on the board. In the manuals and articles dealing with this subject you are not likely to see many positions where the knights are still on the board. After all, in many cases this would diminish the influence of the opponent's bishop, which otherwise would have a monopoly on the squares of one particular colour. Still, in this book, now and then you will find an example of a certain pattern in the endgame. After all, the boundaries of the middlegame are not always crystal-clear - at least not to me. Romanovsky, for instance, has pointed out that major-piece endings also bear a middlegame character, due to the vulnerability of the kings. Also, sometimes a reference is made to a theoretical opening line which features the pattern under discussion; for example the 'Lost Bishop' in the Russian Defence (9...Bxa2!?). The 'No-Nonsense Bishop' even features primarily in all kinds of openings, where this way of developing it has become remarkably popular. Of the patterns I have selected for this book, many consist simply of one and the same piece placement, like a white bishop on d6, splitting the enemy camp in two ('The Beastly Bishop'). Another pattern is where one and the same move counter-intuitively creates a weak square, but at a closer look turns out to bring a lot of benefits as well (for instance, in 'Never Mind the Holes', where ...a7-a5 leaves behind a backward pawn on b6 and a weak square on b5). The plain image of these 'one-movers' may easily help you during the game to hit on the idea. Only in the final part, some more complicated patterns are discussed: manoeuvres (for example ..Kh8/...Rg8/...g7-g5 - the Nievergelt Manoeuvre) or a more general concept like offside pieces (which I've indeed called 'Offside Pieces') or a characteristic battle evolving in a specific pawn structure. This book is not what your ordinary positional chess or middlegame strategy book would look like. Usually, such works start off with broader concepts like attack and defence, bishop against knight, open lines etcetera. And then along the way they go into more detail. These books will (hopefully) supply you with valuable knowledge and understanding. At the same time it is well known that during a real game your decision-making is influenced by the knowledge of patterns you have acquired. So why not study the middlegame in that way? I remember vividly that I suddenly started to see possibilities for exchange sacrifices in my own games after I had collected and studied material on this theme for a training session. Of course, before that I had been aware of the concept of the exchange sacrifice, but somehow the actual moves had become more concrete in my awareness. So I hope that after you have played through the seven (repetition is the mother of learning!) 'Bishop Snatchers', you won't miss any 'Rook takes bishop e6' in your own games any more. Moreover, you will have gained a good impression of the ideas and patterns in the starting positions and the resulting ones. A pattern is no road to immediate success, but it is a good start to get a good idea. After that, the other factors of the position have to be assessed and calculations have to be made. Much more can be said about chess pattern recognition in general, but I will only touch on one practical aspect here. In order to find examples from my database I used the option of mirroring positions vertically or horizontally. With this method I was able to discover the same pattern albeit in different pawn structures from other openings. Somehow this does change your perception slightly. Also, even a simple change of colour can do weird things with your mind. Jonathan Tisdall gives a typical example in his very enjoyable book Improve Your Chess Now. After 1.c3 e5 2.c4 Nf6 we would automatically condemn 3.d3 as passive, he says, and I agree. But with reversed colours it is the start of the Najdorf Sicilian. How to deal with that? Another thing he mentions on this subject is that GM Julian Hodgson regularly tried to gain new insights into certain positions by setting them up with colours reversed. A very interesting method! Indeed, when Jobava plays the Philidor with white (1.e4 e5 2.Nf3 Nc6 3.Be2), how will both players approach and value the position? Also Ljubojevic-Larsen, Tilburg 1981, springs to mind: 1.e4 c6 2.d3 g6 3.d4. But enough of this, I am losing my way inside another kind of pattern. Of course, if you start with such a broad concept, you can pick from a wide range of subjects. Although a couple of the subjects in this book will be more 'regular' or in any case more familiar to the experienced player, I have focussed on the patterns which carry an element of surprise or are preferably 'against' the basic positional rules you have learned. This means that in order to really appreciate these patterns you should have some basic knowledge about the rules of development, pawn structure and strong/weak squares. On the other hand, with these subjects I have often also included an example where the general rules did prevail. Just like there are no rules without exceptions (= some of the patterns in this book), there are certainly no patterns without exceptions. Which means that there are no universal solutions. Either the basic rules of chess still interfere or the circumstances differ. Take also the simple fact that two patterns from this book can occur in one and the same position, for instance a 'Killer Knight' versus a 'Beastly Bishop'. Furthermore, writing on a subject in the first place was often induced by a topical game that attracted my attention. Some pattern caught my eye and made me think of a famous game from the past, or a game of my own. Pattern recognition, you could say. Generally, a search in the books and databases soon yielded other examples. I have tried to avoid using too-well-known examples from the past which have been used in (too?) many text books. Occasionally you will find one though, for example when there is an apt comparison with a topical game. However it would be silly not to refer to them in the text, as the pattern will ring a bell for many of you. Thus, the majority of games will be from recent years. I did however include some lesser-known older games, simply because I like to put things in a historic perspective. The second part contains several counter-intuitive moves: recaptures, exchanges, sacrifices, etcetera. Some of these could also fit into the third part, which I have called 'Typical Strategic Means: Sacrifices'. Indeed this part deals with a wide variety of long-term positional sacrifices. However, I decided to differentiate between sacrificing by capturing something and more surprising silent sacrifices. In the fourth and final part I discuss a number of broader concepts: not certain typical squares for pieces or typical moves, but characteristic manoeuvres or little plans which consist of more moves. The last chapter (40) deals with the pawn structure from the practically decisive 9th World Championship match game in Chennai 2013, which saw a characteristic race between pawns on the king- and the queenside. I'm sure you can think of lots of other pawn structures and plans to be dealt with in the same manner, but that would be another book. Have fun with this one and I hope you also enjoy the exercises! Title: "Improve Your Chess Pattern Recognition"